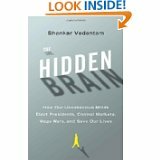 Shankar Vedantam may be a familiar name, along with his book title “The Hidden Brain: How Our Unconscious Minds Elect Presidents, Control Markets, Wage Wars, and Save Our Lives.” He is often on NPR sharing his wisdom about, well, the everyday life of our brains. It’s a good read if you don’t want any detail on what actually is going on inside our skulls. He’s more interested in the ways the “hidden brain” exerts influence than in the how. Vedantam reminds us just how little our conscious minds are in control, unless we are paying very close attention. All is not lost, however, since he concludes that we can turn toward reason ahead of instinct and intuition to solve the problems perpetuated by our “hidden brain.” And all the preceding chapters have great examples of the power of the hidden brain to get us into trouble. Getting ready to tip your restaurant server? You will unconsciously leave a bigger tip if the waiter mimicked you and touched you casually. Good news for the server. Think you can teach your kids not to be prejudiced? Not so fast, and not so easy, since stereotypes are rarely obvious these days, but sneak into our hidden brains, where they stubbornly resist change even when we hear stories that challenge those assumptions. It doesn’t help that most of us don’t think we’re prejudiced (He offers several websites to test this out.) Disheartening to every parent out there trying to teach good values to their kids, when even a story with an African American hero didn’t budge their beliefs, regardless of their own race. How about the hidden brain’s power during 9-11? Vedantum dissects the connections we have with the people in the same room, and shows how group-think hijacks rational thought, unless we physically step around a corner, which loosens our ties to the group, and we can think better. He analyzes the Jim Jones tragedy of the suicidal cult, explaining why some folk were susceptible even to the death of totally irrational loyalty, and how this shows up in suicide bombers (who aren’t crazy, as we all like to think.) He ends by explaining why our brains are so easily overwhelmed by numbers of victims in tragedies, and are wired to respond one to one. Thanks for a great summation and reflections. One of the things that gives me hope – especially about our uncounscious stereotypes that seem so resistant to change is the process of habituation. Repeated exposure can diminish the “disgust” factor (take the case of the acceptance of sushi in our culture that used to be disgusted by the idea of eating raw fish). If laws are changed (using our rational minds) in ways that minimize discrimination, then exposure to the “other” increases, and over time, we habituate to their presence and grow to accept them without feeling disgust (Jonathan Haidt is good on this subject in “The Righteous Mind”).